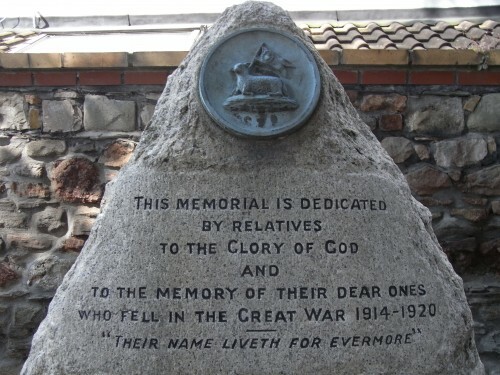 Saddened by the neglected state of this monument and spurred to action by the membership, The Redland & Cotham Amenities Society (RCAS), has undertaken its conservation, in this the Centenary Year of the commencement of hostilities. 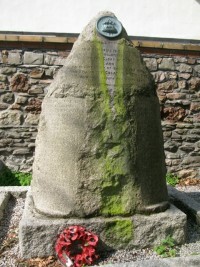 Steve Morris, a member of RCAS and a BBPT board member, urged that even though this particular memorial was not Listed, it was nevertheless venerable and needed to be treated with care, following the principles set out by English Heritage and the Society for the Protection of Ancient Buildings, and endorsed by Bristol City Council’s conservation officer. The first step was to research the Names of the Fallen, which had become almost illegible. Next was to establish the ownership of the monument, which once stood in front of St. Saviour’s Church before being moved to an adjacent spot when the church was converted to flats in 1970. Then, with the blessing of the flat’s management company and using funds from its own resources, RCAS employed Richard McPhail and Philippa Fawcett to carry out the conservation work. Richard McPhail is a conservation mason who has worked on numerous historic structures, from cathedrals (including Bristol, Gloucester and Salisbury), churches and monuments, to the Tower of London, to prehistoric burial mounds, as well as many local private houses. Phillipa Fawcett is a conservator and lettering expert who has also worked on many historic structures, cathedrals, churches and monuments, including various other war memorials, the Albert Memorial and the Roman Baths in Bath. Eschewing the use of chemical cleaning agents, Richard lightly cleaned the face of the monument, using only a brush and water. Philippa then lightly re-cut the letters, only where absolutely necessary to aid legibility, before carefully painting them in. Two mysteries remain. Firstly, the date for the end of hostilities is given as 1920. According to the Imperial War Museum, who maintain a database of all such monuments, war memorials can present end dates of 1918, 1919, 1920 or 1921. Reasons for the variation include marking the Armistice (1918); the signing of the Treaty of Versailles (28th June 1919); the marking of the death of the last casualty named (as perhaps here); and marking the official end of the war for the United States (1921). A further suggestion has been that it included the Russian Campaign. 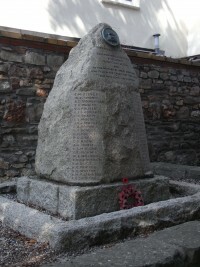 The decision over which date to present would have been taken locally by the committee formed to erect the memorial and it is the case that they could choose a date that they felt most appropriate for their memorial and the commemoration of those named. Secondly, two names are absent from the memorial itself, though they do appear on a memorial board originally from St. Saviour’s, since relocated to Cotham Parish Church. 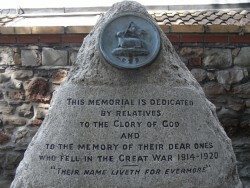 It is thought that these may possibly have been names of men who died of their wounds, after the memorial was erected.